70-ish here in the Virginia Piedmont. I'm going to take my bike out again. Here in the middle of the UK it's unseasonably warm, but the rain never stops. North of here their's so much flooding, it must be heartbreaking to see your home or business be destroyed. According to the news Texas, Louisiana, Georgia, and some other Southern states are seeing flooding. I hope NELA, Beamer's kin, and StrummerboyBill are making out OK. Or any others I may have missed. We're in the 6"-12" swath. The yellow that is out of view is 18"-24"
Stay safe out there folks. Or even better, stay home. Makes it easier for me to plow. Cold w/ rain, here. Got almost 2" yesterday. Today's low temps at 29 while tomorrows will be 25. Great phishing weather as it will put the crappie on the bottom in about 40' of water. Planning on phishing this weekend so if anyone wants to tag along just give me a call. Light rain and mid 50 degrees out here,not bad at all. Snow finally arrived, started yesterday, the weather alerts are predicting 18 inches. 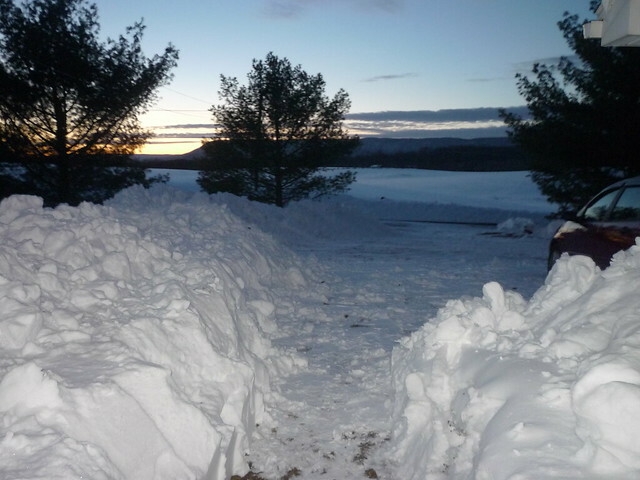 Used the snow-blower to get the jeep out yesterday and had to do it again this morning plus cleared a path to the wood-pile. It's still snowing so I get to do it all again tomorrow. plus cleared a path to the wood-pile. I brought about a half cord into the garage yesterday. That'll last us a couple weeks. I can cut a path to the wood shed at my leisure. They bumped us up a bit. We're at 10"-15" now. I'm going to be real busy for the next 36 hours. Looks like you will be really busy for some time! I'll be done plowing by 7-8 Sunday morning unless this things moves a little farther inland. Our thoughts are with all Chordians under the load of this current storm. This system was scheduled to hit Atlantic Canada earlier in the week, but will now blow out to sea before it reaches us. I made one pass through my run overnight. Headed home for a little nap before going out later. A 20 minute drive turned into 1.5 hours. This is the first time I've experienced true White Out conditions. I, literally, could not see the front end of my truck and had to stop many times. I really need that nap. I been watching your weather on the news and wondering how you cope. On this side of the pond, if we have a couple of inches the country shuts down. Stay safe everyone. Hope everyone affected by this storm is safe and warm with enough supplies to last. Keep safe, my friends, and stay out of the storm, if possible. It's snowing and blowing like mad here in the Virginia Piedmont. Kind of fun. It got up to about 18" on the flat (but drifting a lot) and so I decided to shovel out my patio and a path to the front door and the street. Our town's snow plows are broken, so we're going to be stuck for a while. No big. We've got booze, food, lots of water and juice and healthful drinks, have kept our power, and all is snug, warm, comfortable, and ready. I've been watching the news keeping an eye on you guys! We got hit last week - but it's "normal weather" for my area. I hear we sent a bunch of snow plows over toward Long Island to help out. Sounds like we should have sent them to Virgina instead (although... Long Island doesn't really own any plows, compared to Zurf's town just not keeping them working). Stay Safe Fellas!!!! OH... and keep it too. We don't want it up here. I hope all of you will be safe and warm in the storm area. I couldn't go anywhere even if I wanted to; which I don't. Our road is nothing but 5'-7' drifts. 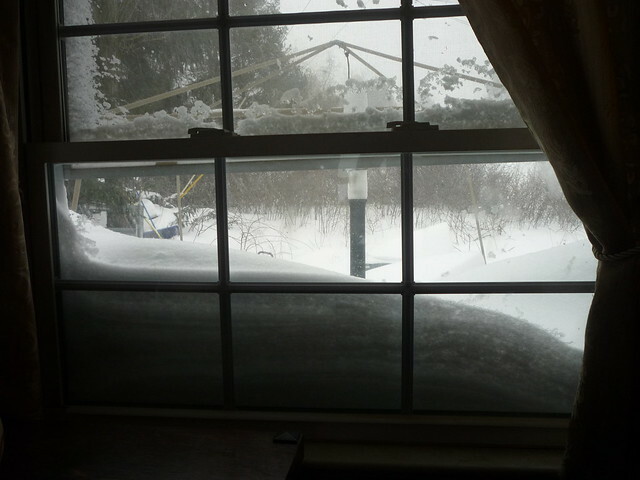 The township plows and within an hour we're drifted in again. I don't even know why they bother. I understand the reasoning behind it but once the drifts are at the same level as the field, the snow just blows through and doesn't get ant deeper. Looks like the wind will continue through most of tomorrow so it looks like I won't be going anywhere until at least Monday. Makes me glad I'm retired and don't have to go anywhere. We got hit pretty hard but I think the worst is over. We got off easy. About 7" of snow this morning. About two hours work with the blower and shovel and my drive and parking area were cleared. Spent the rest of the day watching the auto auction in Kissimmee FL on TV. We were right at the edge of the storm, just 15 miles north they only had 1". DE - 7" isn't too bad! Lucky you! Joe - has the wind stopped yet? Snow drifts are the worst. Roads can be clear in one area, and have a foot of snow on them just down the road. I hate that. FEET of drifts does NOT sound good. In fact, it sounds like guitar weather to me. 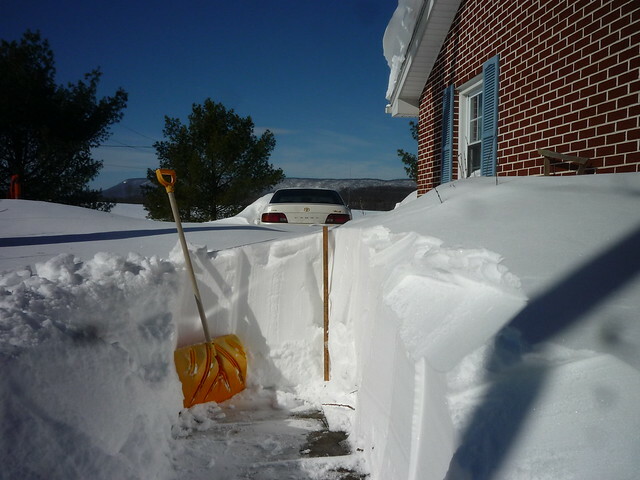 • 40 inches of snow was recorded in Glengary, West Virginia; 39 inches fell in Philomont, Virginia; and Redhouse, Maryland, received 38 inches. • 25.1 inches of snow at Central Park, the third-largest snowfall on record. • More than 28 inches of snow at Dulles International Airport, the second-largest snowfall recorded there. Baltimore's BWI notched 29.2 inches. • At least 14 people dead (six in North Carolina, three in Virginia, one in Kentucky, three in New York City and one in Maryland). • 11 states declared states of emergency: Georgia, Tennessee, Pennsylvania, Maryland, Kentucky, North Carolina, New Jersey, New York, Delaware, Virginia and West Virginia. Washington, D.C., has declared a "snow emergency." • 8,569 flights canceled for Saturday and Sunday, according to FlightAware.com. • More than 74,000 people without power. Even if my area got hit with those kind of snowfalls, we'd have issues digging out. That's a LOT of snow in a short time. I can't imagine how it is in some of the areas that simply don't have sand or salt trucks and only little plows. I was just reading on the Northern Virginia DOT site (VDOT) that they use regular ole pick-up trucks in suburban areas to plow residential roads (and cul-de-sacs). The areas hardest hit just do NOT have the ability to handle it. I have to remind myself of this all the time while watching the news. Stay in and indulge in good food adult beverages and watch Football playoffs. I had too go out and mow my lawn this morning. We are between Philomont, VA and Dulles Airport both geographically and snow total wise. NWS has us at 34", though our personal measurements were between 28" and 32" on the flat areas. 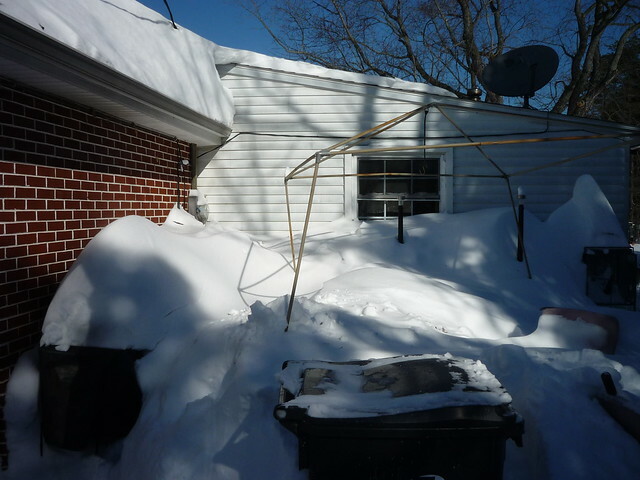 I worked with my wife and kids and neighbors to dig us out, and then to get the folks next door. They're OK to watch for themselves most times, but with a 60 year old whose had multiple back surgeries and her octogenarian mother with a bad back and heart condition, we figured why not help out? We had a nice visit with them too, which is always welcome. More digging tomorrow, I'm sure. The neighbor who is wheelchair bound needs to be dug out, but until they plow the road, there's no point. He couldn't get out anyway. We'll get him taken care of soon enough. This neighborhood looks out for its own. This is from my little room the day of the storm. This is outside looking at the same window. Now I will turn to my left and look alongside the house. The snow was too deep for the snowblower. That's a yardstick on the right. The backdoor and the driveway are now connected. Look closely The little black speck to the right of the center tree is the tip of our mailbox.